Click on the image for a full-sized picture, then right click on the full-sized picture and choose "Save image as". in mind that you might need to resize it so that it fits on your arm. Print the dark mark out. Using the craft knife, cut out the black areas of the stencil, so that you are left with holes in the shape of the dark mark. Cut around the edges of the dark mark so that you have an outlined stencil. Place the dark mark on your left forearm with the skull pointed towards your elbow and fix in place with tape. Using the marker, trace the outline of the dark mark and then outline all of the inner stencil areas. the whole Dark Mark, and all of the interior shapes as well. 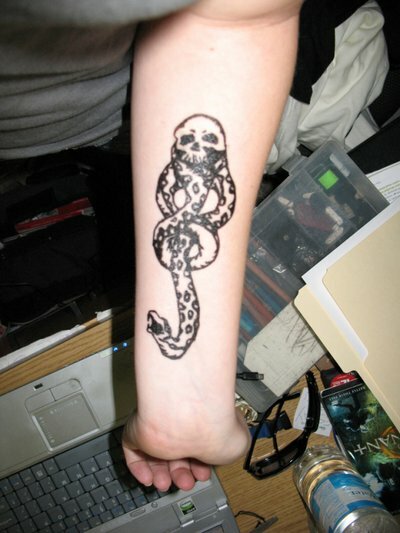 Using the marker, fill in the outlined areas of the dark mark. Spray liberally with aerosol hairspray and allow to dry completely. Assume appropriate Death Eater attitude! And you're done!! © starbucks5721's tutorial was taken with permission from the HP_costuming LiveJournal community.